The need for the annual tyre safety campaign in October has once again been underlined by the research carried out by the TyreSafe team and the evidence collated. TyreSafe and tyre safety awareness depend on support to drive the change in attitudes needed to help reduce the number of tyre-related incidents on our roads. A study conducted by TyreSafe* revealed Britain’s motorists could be spending up to £600 million on unnecessary fuel bills. Research** suggests as many as 57% of car and van tyres on the roads are being driven below recommended inflation pressures, increasing vehicles’ fuel consumption and the risk of being involved in an incident. 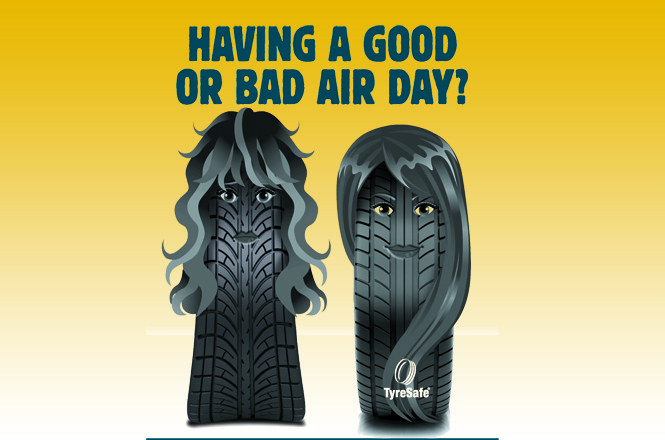 As a result, the question the tyre safety charity is posing to the country’s drivers during October’s forthcoming Tyre Safety Month is: Are you having a Good or Bad Air Day? While the need to carry out regular tyre checks may seem obvious an alarming number of Britain’s motorists are replacing their tyres only when they have already become illegal and dangerous. If they carried out tyre checks, this avoidable safety issue could be rectified. A shocking 35% of tyres are being driven at least 8psi below the vehicle manufacturers’ recommendation.